Here she is all done! 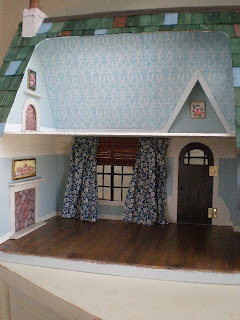 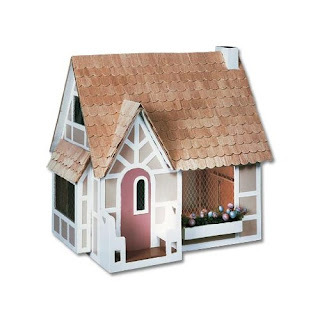 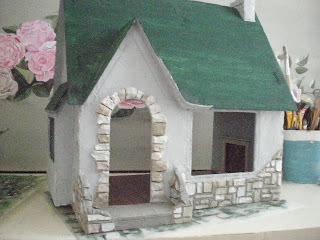 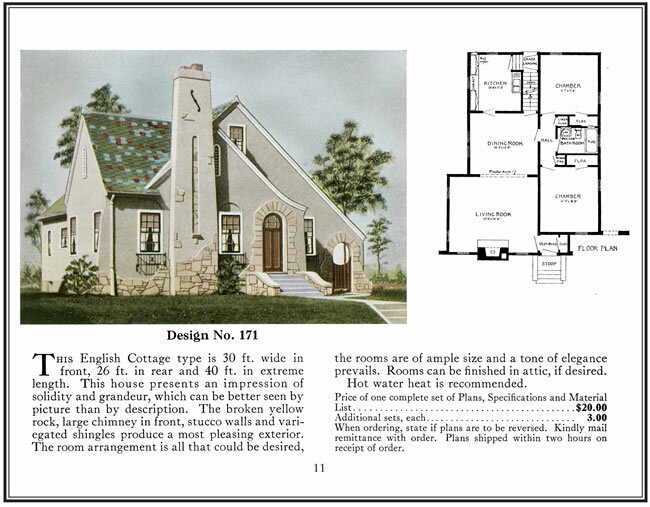 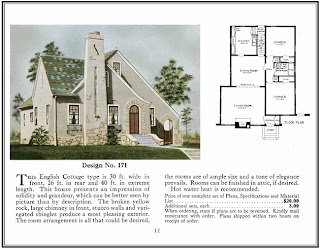 I think this sugarplum kit by Greenleaf was just perfect to turn into a 1920s house. 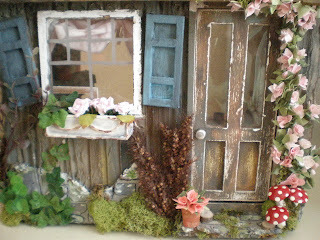 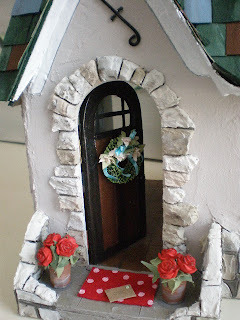 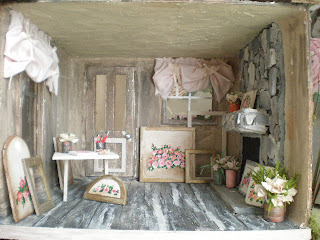 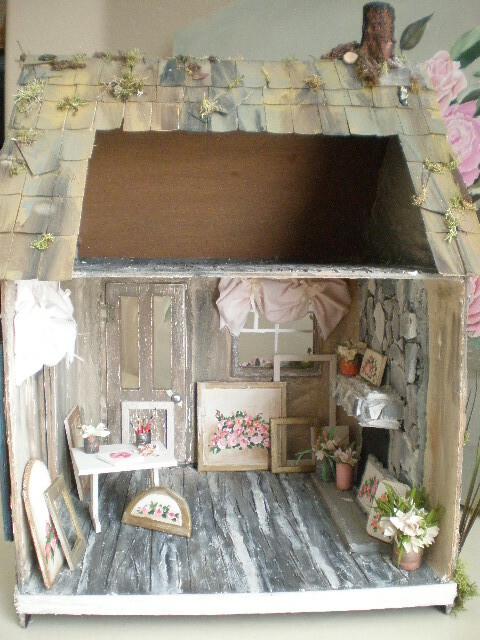 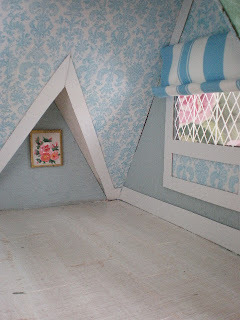 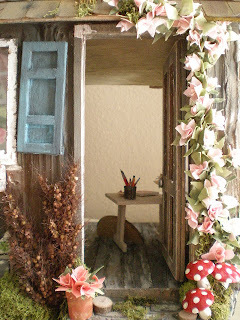 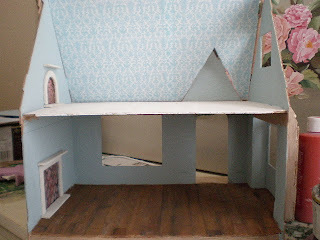 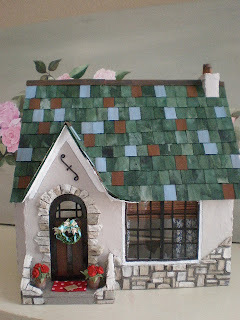 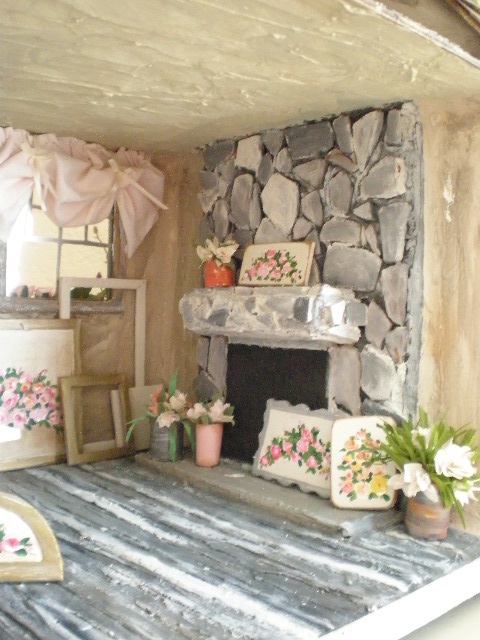 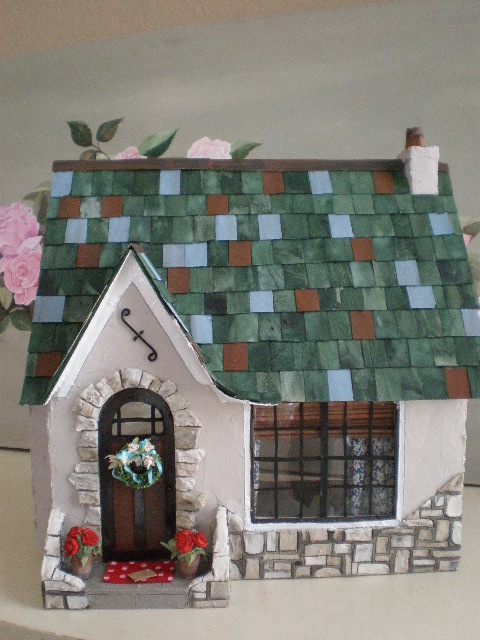 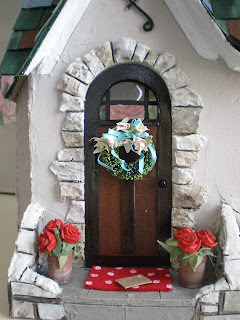 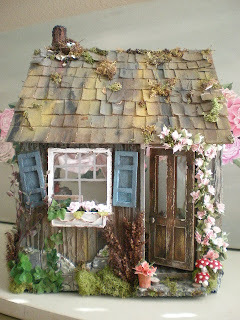 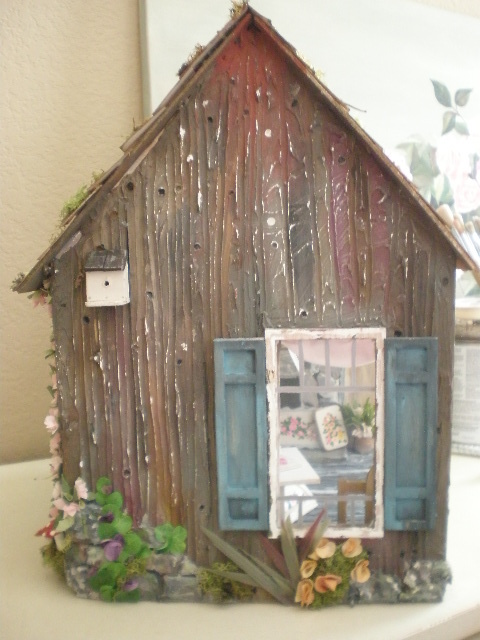 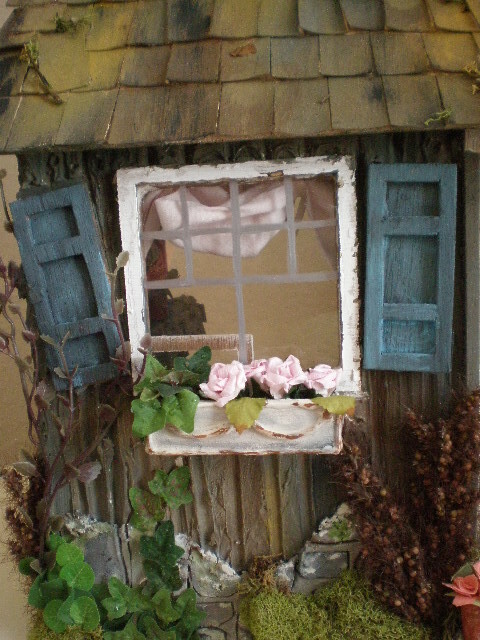 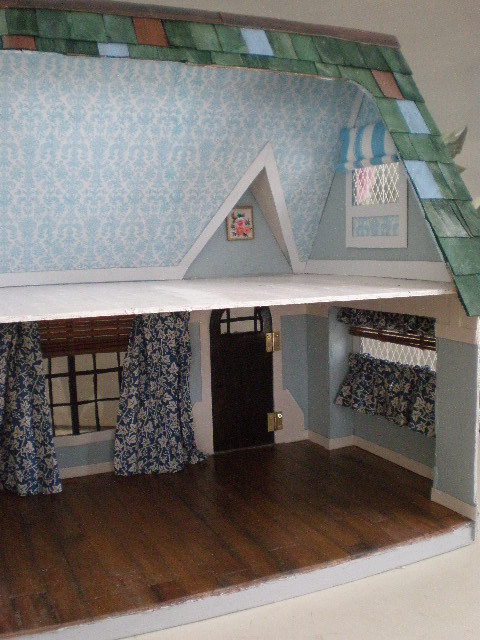 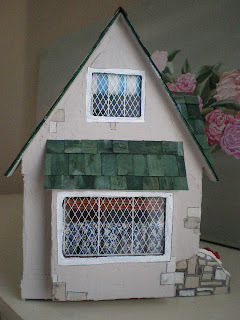 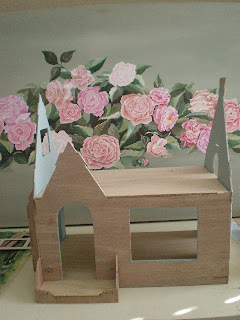 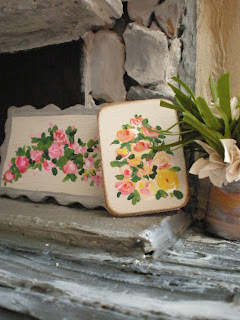 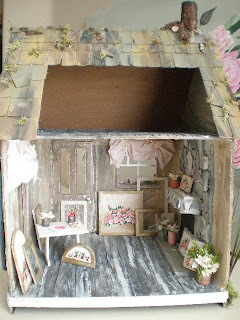 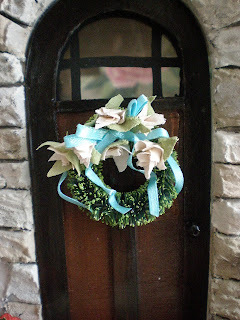 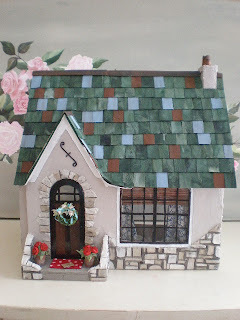 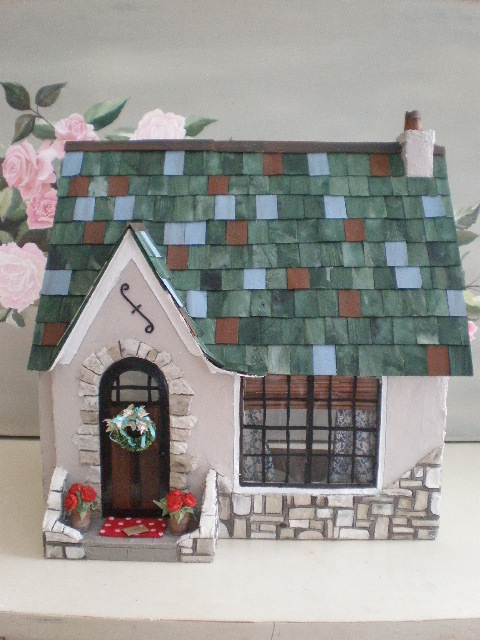 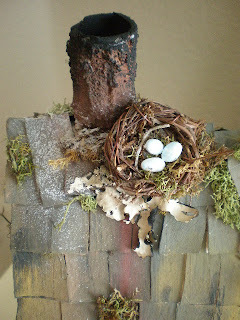 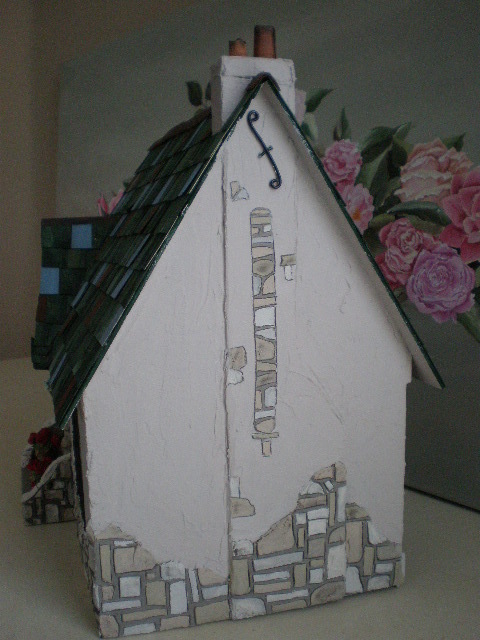 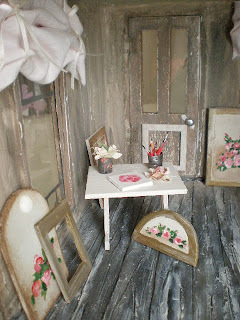 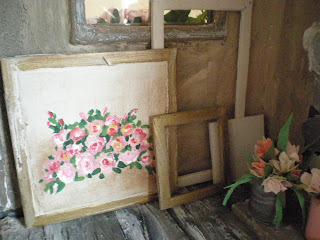 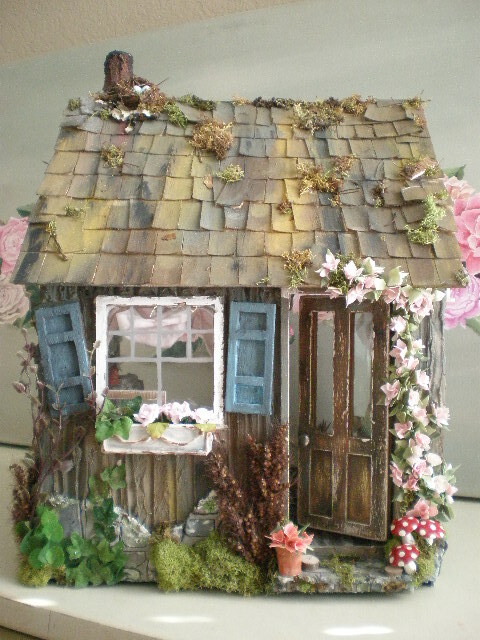 Here's a reminder of the inspiration house sent to me by Melody of Brown Gingham Creations. I love doing front porches. I made the door mat from felt and white paint for the dots. 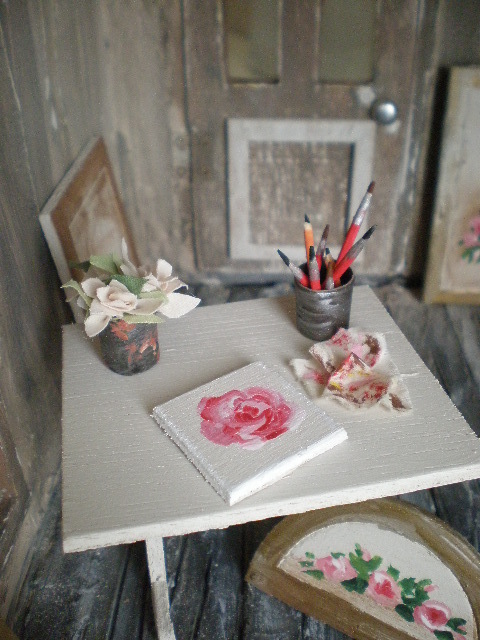 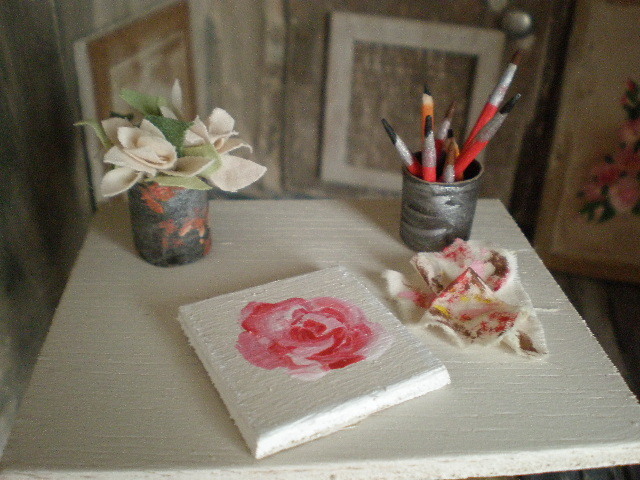 The pots are cardboard with roses that are used for scrapbooking I think. For the wreath, I painted a left over Christmas wreath. 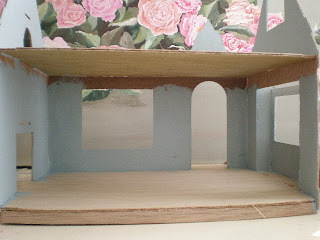 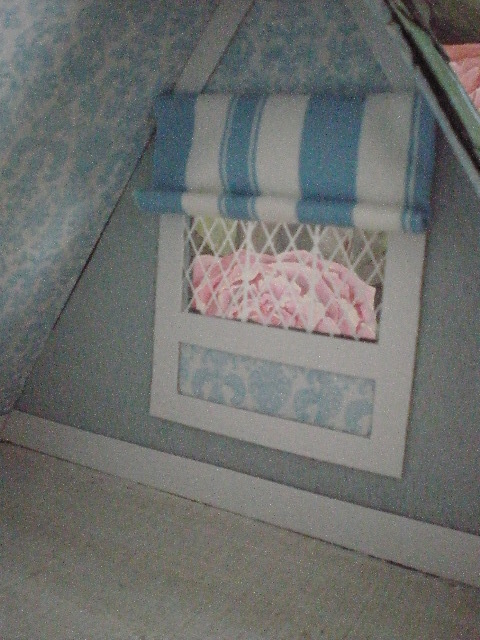 I added a sky blue ribbon and handmade fabric roses. 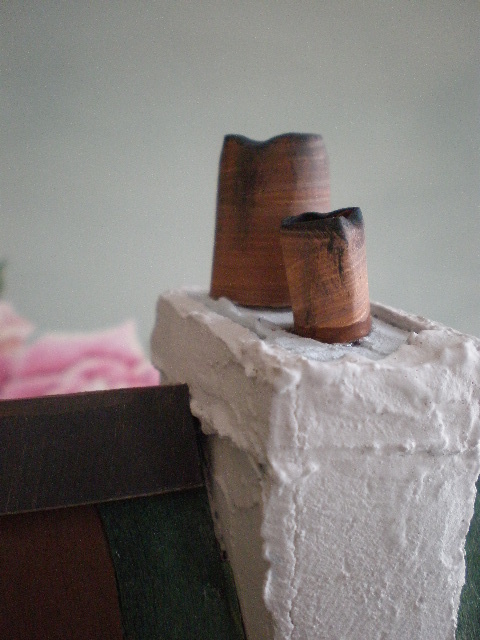 These are the little chimney pots. 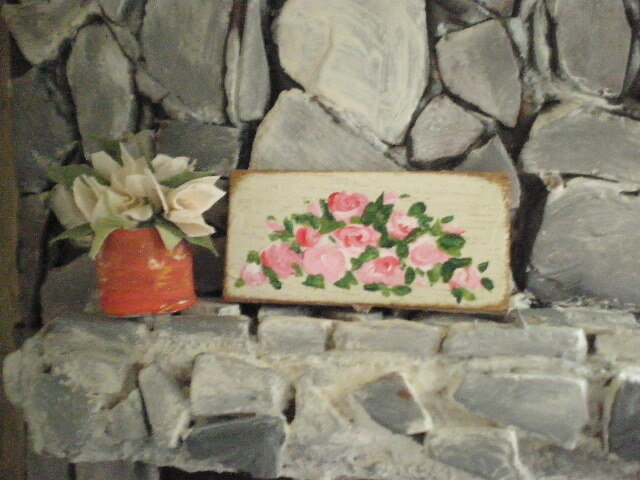 I thought I would put the little one a little crooked for added character. 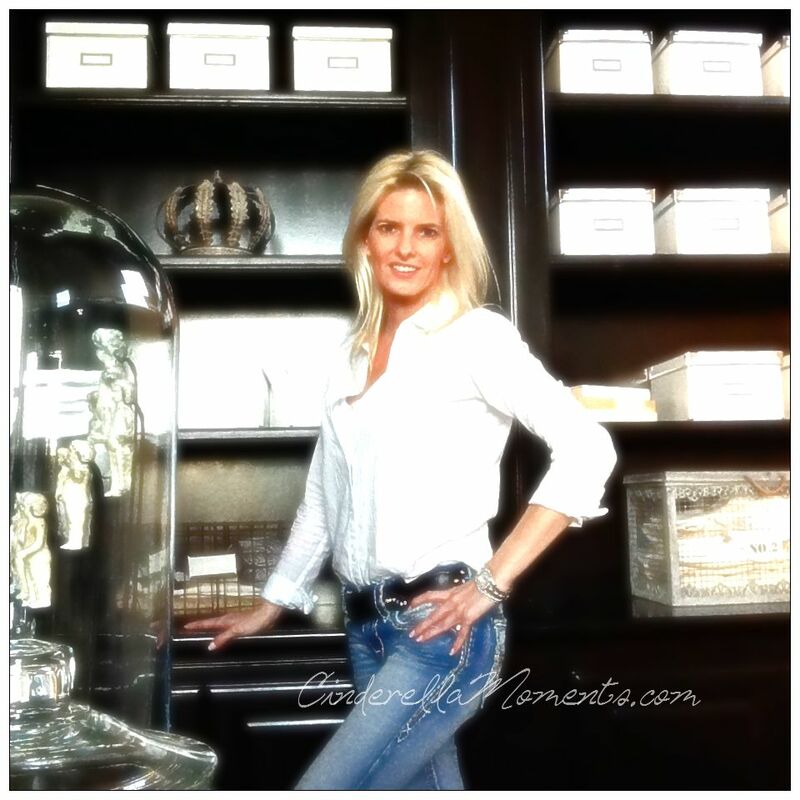 I wanted to keep this one very clean and airy with a relaxed style. 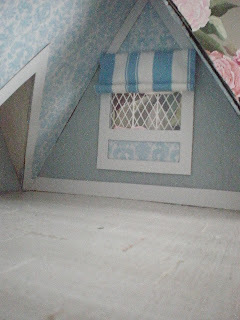 Today, I had some interior decorating fun. 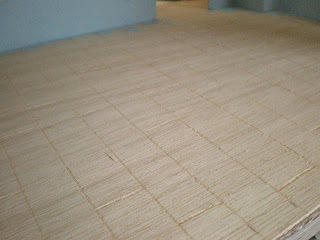 I did these little matchstick blinds from a place mat. I usually spray the curtains with hairspray to keep them in place. But this time I just ironed them the way I wanted them to look. 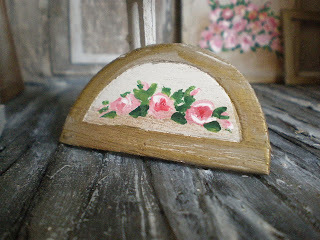 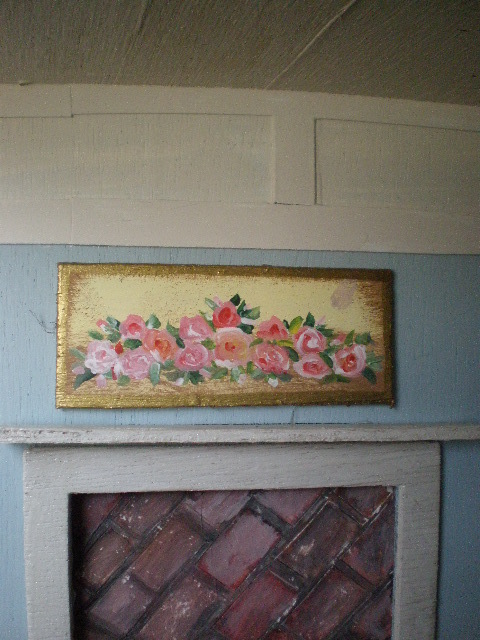 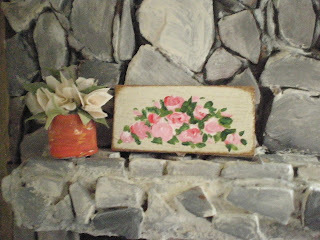 I painted some roses on a yellow background to put above the fireplace. 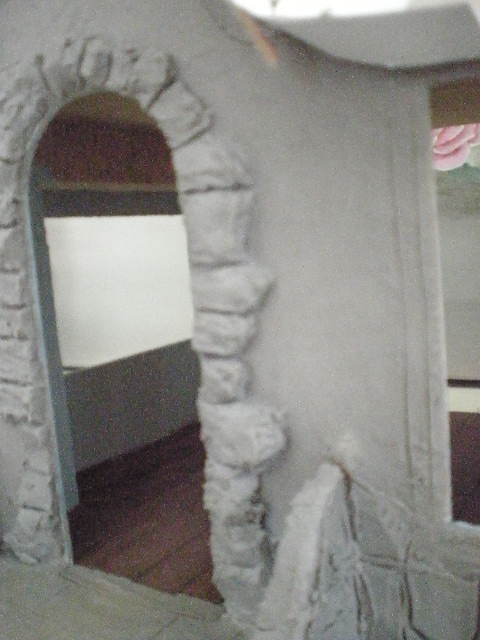 I did a molding that was a little different. 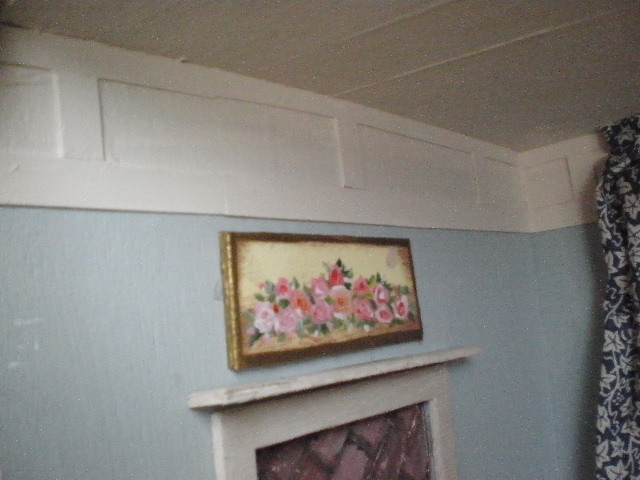 I have no idea where I saw this type of molding. I just had it stuck in my brain for a long time! 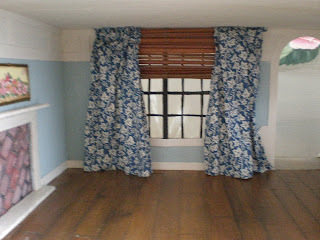 This is the other downstairs window. 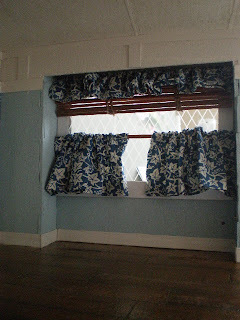 I love the cafe curtains in cottages. I also putt the matchstick blinds here. 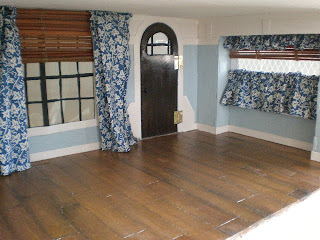 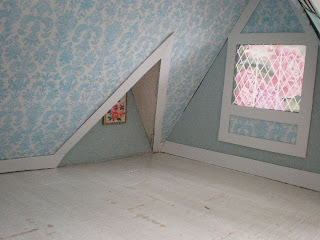 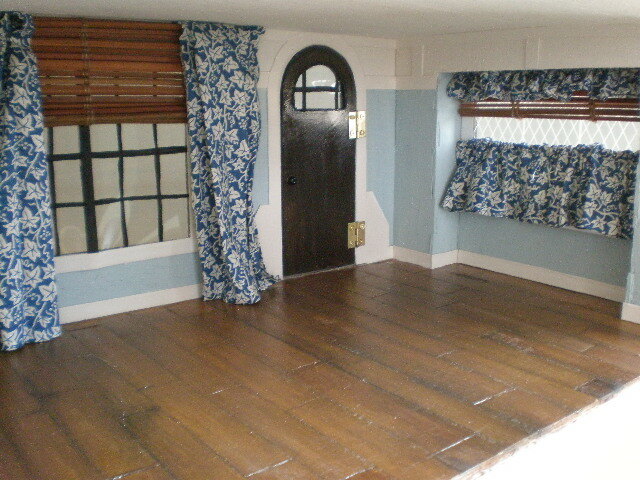 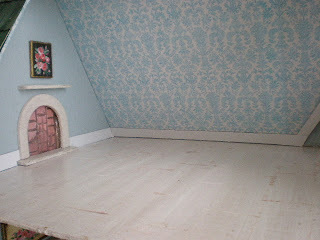 This is the upstairs. 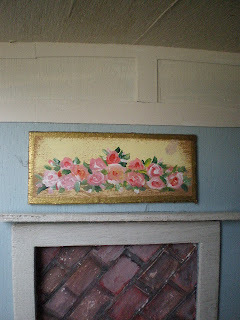 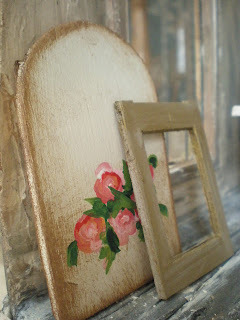 I painted a couple more rose pictures to put up here. 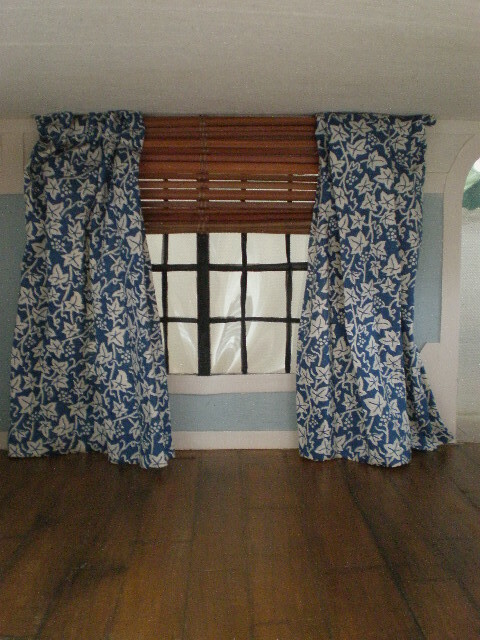 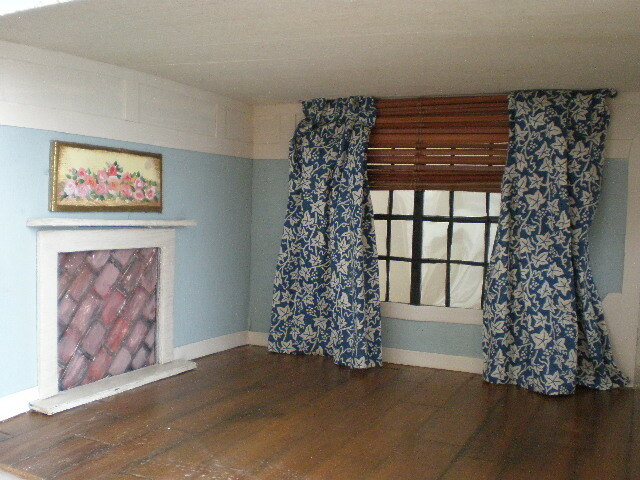 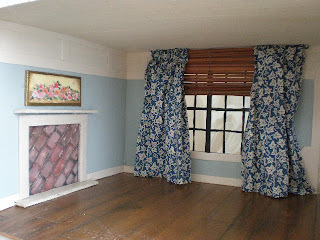 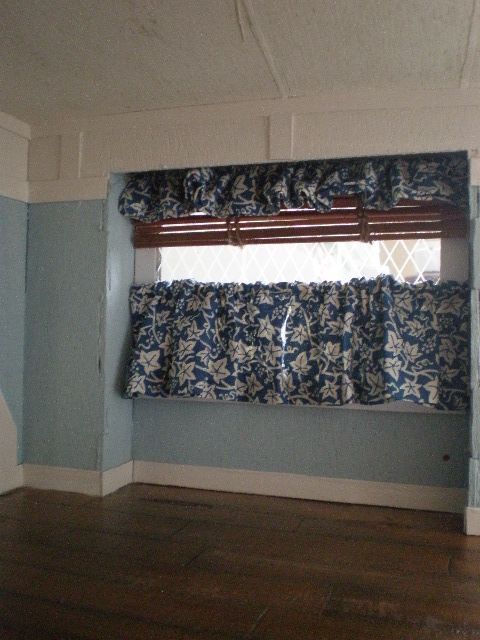 I decided on a striped blue roman shade for the attic window. 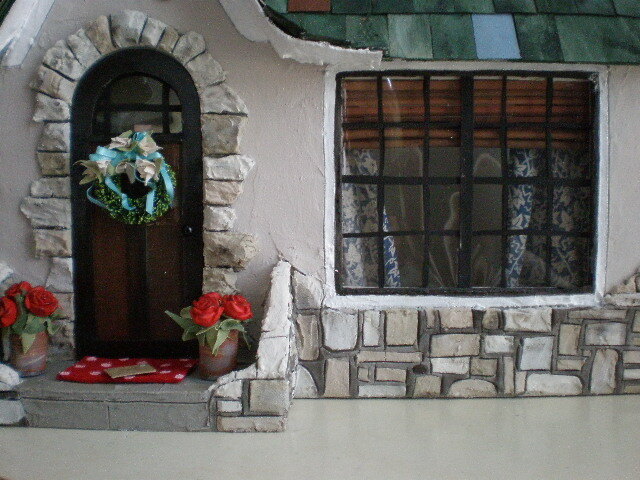 The front door is still drying. 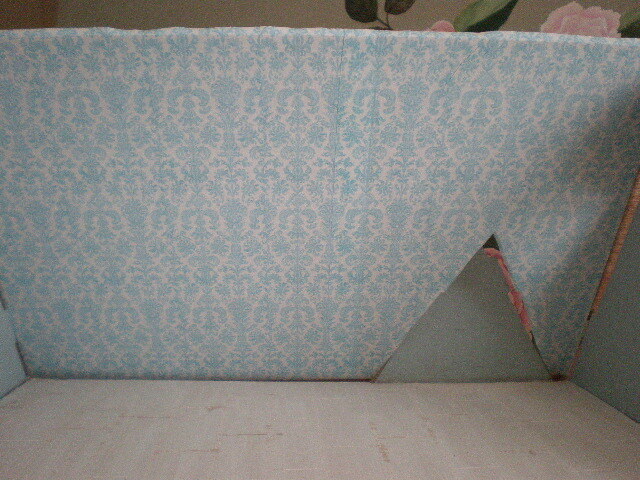 It will go on next. 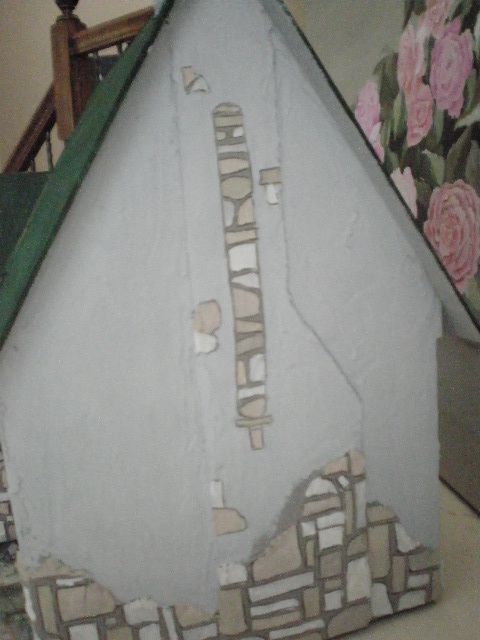 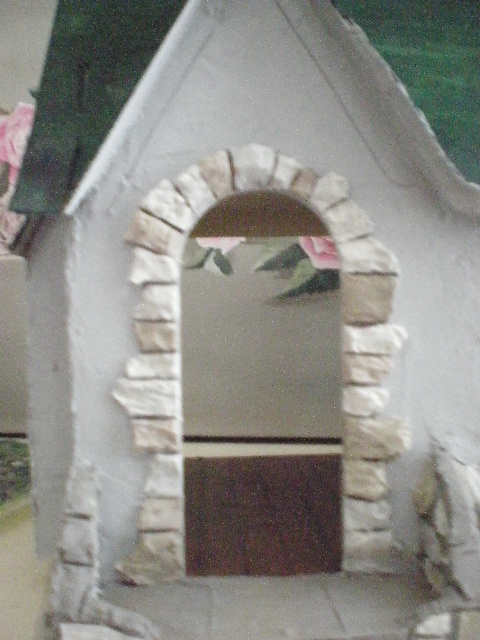 I finished my stucco and rocks on the cottage. 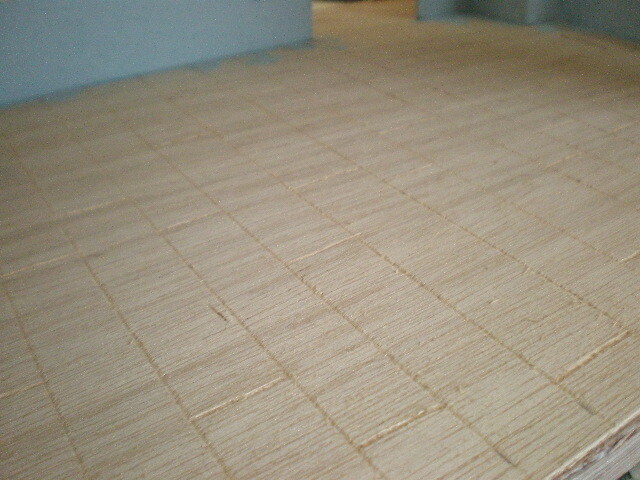 I use patch concrete for this. I carve the rocks with a coat of concrete that is thicker. I painted the stucco a warm gray. 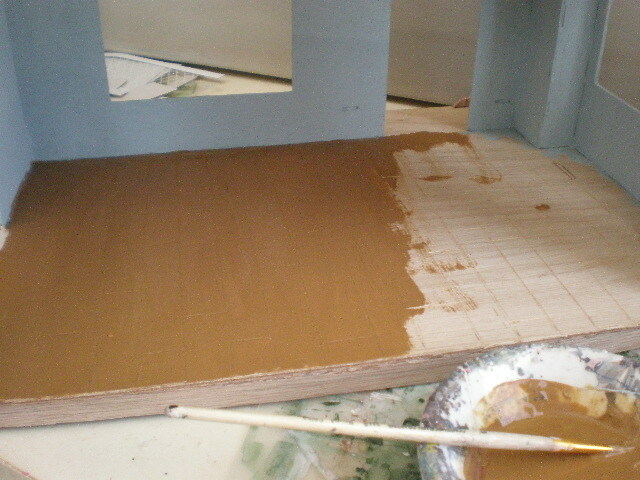 The rocks are done in different shades of cream/tan. 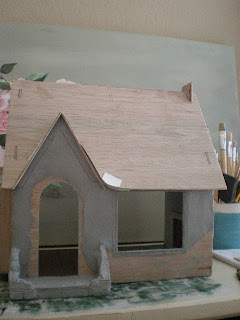 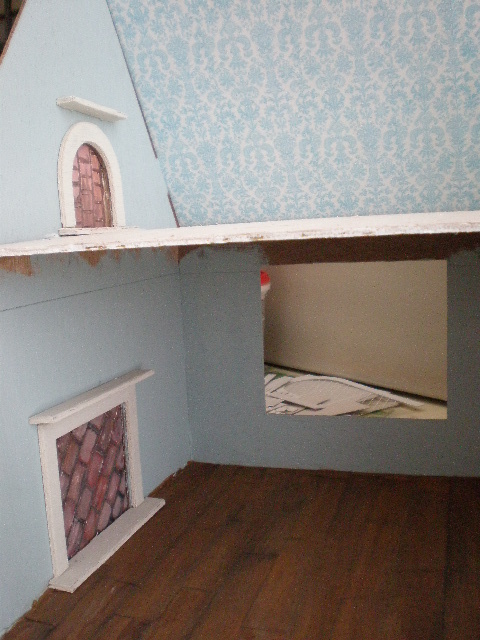 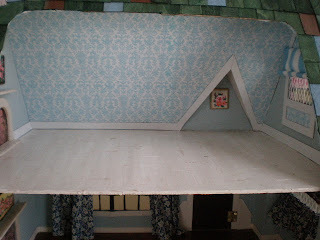 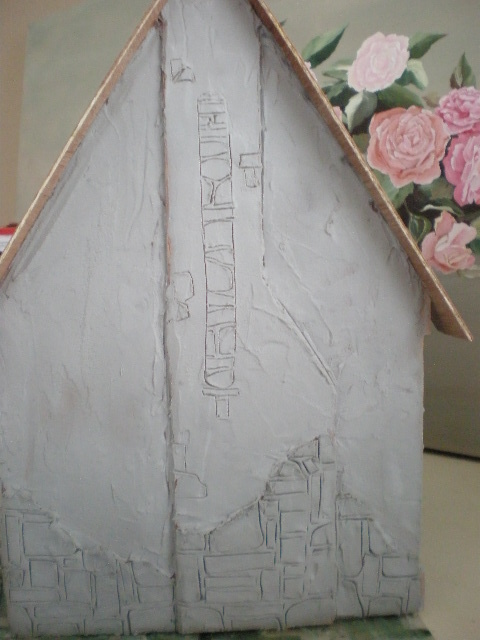 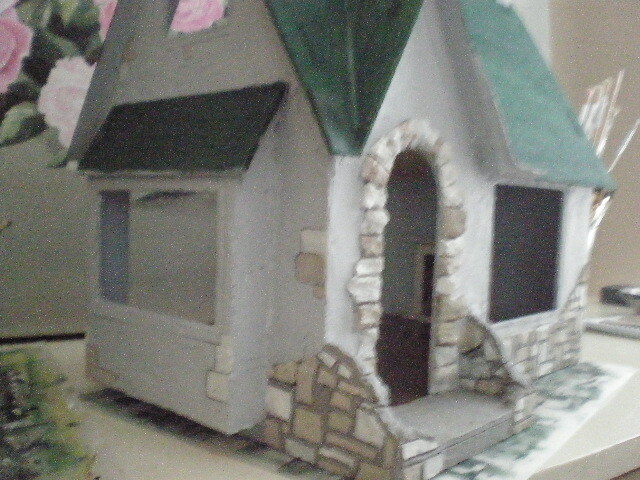 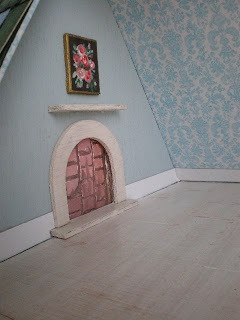 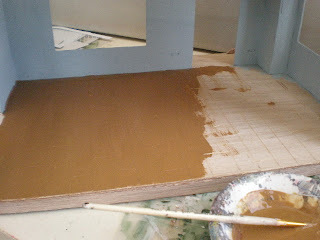 I painted the roof green so that when I put the shingles on, no unfinished wood will show through.